We’re headed back to Pleasantville, dear readers. 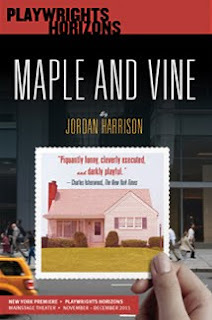 Although, much like in the Reese Witherspoon movie from the 90s, in Maple and Vine we see that the 50s, while they were perhaps a simpler time, what with the malteds and sock hops, they weren’t all we romanticize them to be. Jordan Harrison’s new play, enjoying a run at Playwrights Horizons, focuses on Katha (Marin Ireland) and Ryu (Peter Kim), a married couple living in the present. But not for long. A stranger who looks plucked from the past, Dean (Trent Dawson), meets Katha in a park and before long, he and his wife, Ellen (Jeanine Serrales) have convinced Katha and Ryu to move to and join their Society of Dynamic Obsolescence (SDO), a custom-built community (think Celebration, Florida) in the Midwest in which it is perpetually 1955. It’s an interesting premise, and the questions it raises and points it makes are thought provoking, though the play, directed by Anne Kauffman, loses steam and devolves into caricature silliness toward the end. I can understand why someone might long for the 50s. Looking back at the era, many people think of it as a simpler time. Certainly, folks didn’t feel tethered to technology they way they do now. Living in this world of limitless possibilities can be overwhelming. In the play, when remembering life in the real world, one of the characters even comments, “We could have anything we wanted so we didn’t know what we wanted.” I’ve actually made a related argument with regard to an artist: that if you give an artist free reign, the first thing s/he’s going to do is ask for or create some boundaries. Otherwise you’re just staring at a blank canvas, not knowing where or how to begin. As Ellen puts it to Katha, when you join the SDO, you trade one kind of freedom for another. You learn to find freedom in the rigidity and limited choices. So I get desire to hop in your DeLorean and go back to 1955. (Maybe not so coincidentally, 1955 is actually the year Marty and Doc travel back to in Back to the Future, Part One.) But the thing is, the SDO isn’t all it’s cracked up to be. Which is one of the reasons I liked Alexander Dodge’s scenic design. In present day, the backdrops were made to look like rain, as if 2011 has only rainy days and gloom. When we enter the SDO, the “1955” homes are adorned with bright, sunny and (nauseatingly) cheery wall paper, suggesting that bad things don’t happen in 1955. Of course, these backdrops were both juxtaposed with what was actually happening in people’s lives. There was some happiness in 2011 and there is plenty of clouds and gray in 1955. Moreover, when Dean and Ellen make their pitch, even before Ryu expressed this to Katha, I thought it sounded like a cult. The SDO has its own gated community with its own set of rules and way of life. Newcomers have to be indoctrinated into the mores of the SDO and forget their “old lives.” And, much like a cult might do, Dean and Ellen seemed to prey on hapless humans. After a miscarriage, Katha and Ryu’s faith has been shaken; life is getting rough or even unbearable, so Dean and Ellen give them something to believe in, something to give their lives structure and meaning. The whole thing is more than a little creepy. Sure, life before gourmet home cooking might have been simpler, and it seems like giving up a spice here or a computer there is not a big deal, but that myopic worldview of 1955 extends to human interaction. Racism is still prevalent in the SDO, as it would have been in 1955, and gay people stay in the closet. Women don’t work but rather spend seven hours a day trying to perfectly execute a chicken stock recipe. And even though no one has “heard” of Facebook, everyone knows everyone’s business because a good neighbor lends a caring ear (and later a blabbering mouth).